AMDA | AMDA News - AMDA Alumni Perform with Placido Domingo in LA Opera's "Simon Boccanegra"
AMDA Alumni Perform with Placido Domingo in LA Opera's "Simon Boccanegra"
Congratulations to our six AMDA alumni who will perform as supernumeraries (non-singing ensemble) in the prestigious Verdi masterpiece Simon Boccanegra, starring the legendary Placido Domingo, at the LA Opera. AMDA graduates Matt Jennings Turner, Anton Fair (Schwaegerle), Reid Boutte, Russell Williams, Ben Gould and Barrett Hill will perform in several intricate stage combat sequences throughout the opera, under the fight direction of AMDA's own faculty Charles Currier. The production will be conducted by the internationally renowned James Conlon, opening at the Dorothy Chandler Pavilion in Los Angeles on February 11, 2012. An LA Opera company premiere, Simon Boccanegra is a grand-scale study of power and treachery that finds an emotional center in the tender and unbreakable bond between father and daughter. Verdi's poignant score brings his characters to vivid life in a series of striking encounters that spans two generations. 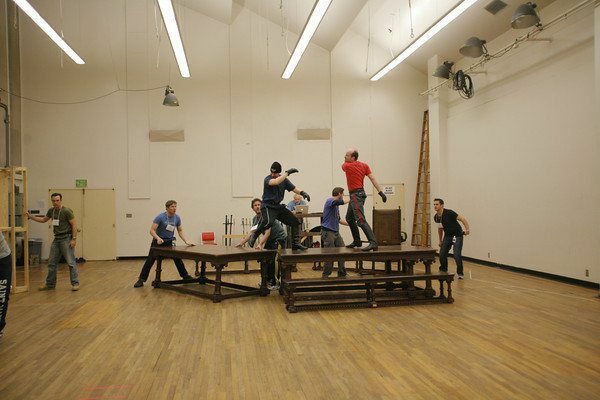 See some recent photos of our AMDA alumni rehearsing stage combat scenes for Simon Boccanegra below.